Long ago, graham crackers were often the first type of cookie given to young children. They were not overly sweet and softened up easily as the child gummed them into a swallowable mush. The graham flavor I seem to remember, however, was different than today's squares and rectangles. My guess is that the ingredients back then were more whole and less altered by scientific substitutions. The Reverend Graham, who supposedly invented this namesake cracker, might not even recognize today's boxed treat. His cracker contained whole graham flour and eating them was his answer to curing the lusting tendencies of humans. While I doubt that there was any science behind Graham's eccentric idea, the cracker remains a staple in many households because it is versatile and inexpensive. When crushed, graham crackers are the main ingredient for cheesecake crust well as some pie crusts. They are used for homemade ice cream sandwiches and what would a campfire be without s'mores? . Today's recipe is a variation of post # 40 with the addition of coconut and milk chocolate. It must be refrigerated after baking to keep the bars from becoming soggy. When I first came up with this version of Praline Bars, my husband was out of town. I ate more than half the bars before he returned. I couldn't stop eating them! Line a cookie sheet (15x10) with foil. (If your pan is larger, just fold up the edges of the foil to measure 15x10. Line the foil with graham crakers. In a small pot add margarine and brown sugar. On med. heat, bring to a boil. Boil for 2 minutes. Remove pot from heat and add nuts and coconut. Mix well. Pour mixture over crackers and carefully push the nuts and coconut evenly over crakers. Bake in a preheated oven (350 degrees) for 10 minutes. Cool slightly and sprinkle evenly with milk chocolate chips. When melted, spread evenly but lightly with a fork. Put pan in refrigerator. 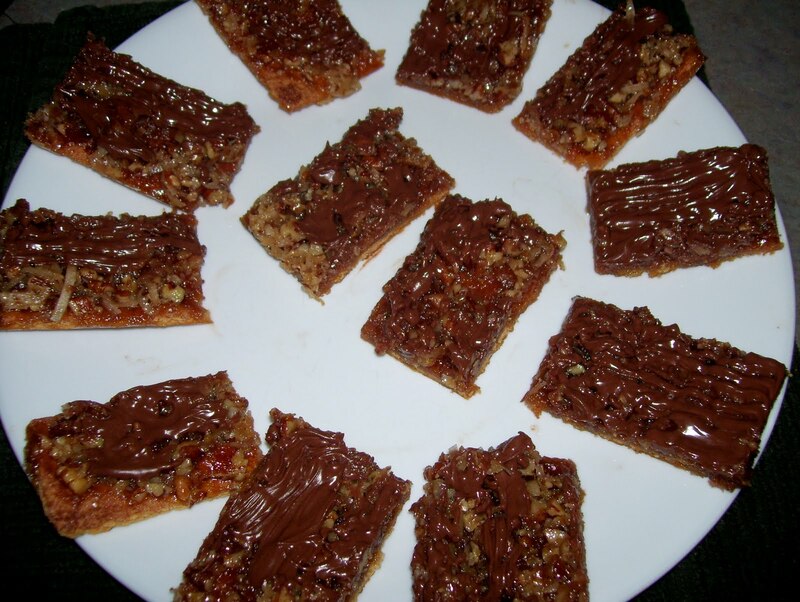 When chocolate is firm, cut crackers into oblong bars. Place bars in an air-tight container with waxed paper between layers; store in the refrigerator.